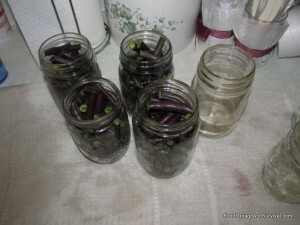 Canning green beans in all their varieties is one of the easiest pressure canning projects you can do. 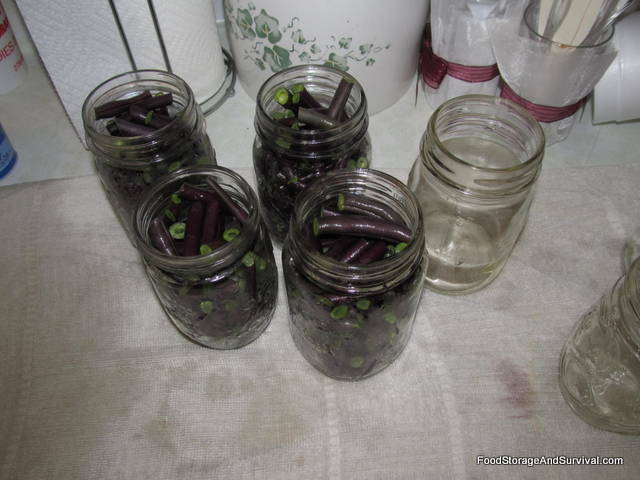 Beans are a super-producer most gardening years, and canning them is one of the best ways to preserve them. Once beans are ripe on the plant, they will continue to produce more beans if the ripe ones are picked regularly, which can lead to an abundance of green beans. It’s definitely green bean season here, so here’s a little lesson on how to can green beans, courtesy of my mom. 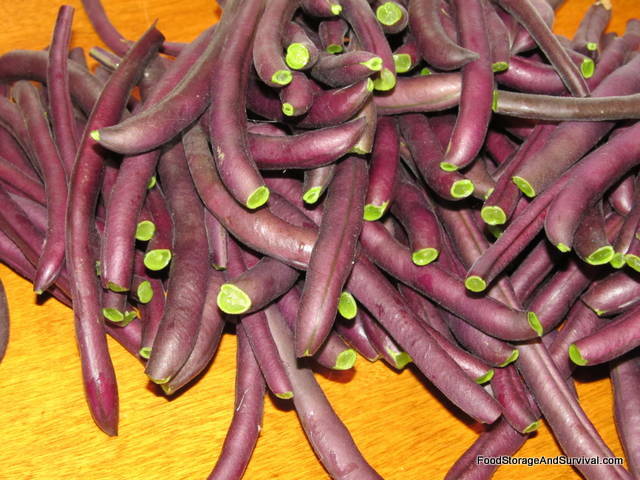 Green beans or purple beans or wax beans or a mixture of these beans. 1. Get your beans. 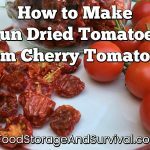 You can purchase them from a store or farmer’s market if you aren’t growing your own. If you have them in your garden, just get out there and pick some! Today we’re working with some wax beans and some purple beans (they turn green when they are cooked). 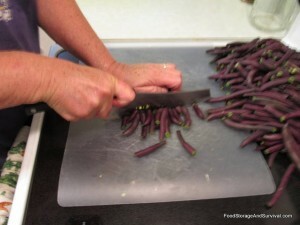 I promise the process is exactly the same for canning green beans if they are actually green to start with! 2. Trim the ends. 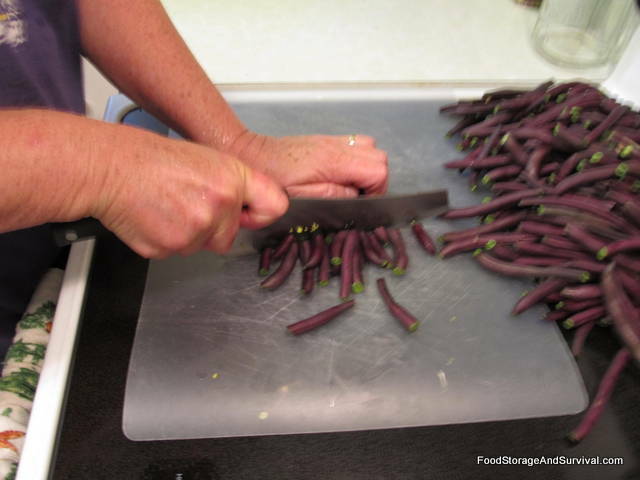 It produces a better finished product if the ends of the beans are snapped off prior to canning. 3. Snap or cut them into bite sized pieces. You can leave them whole if you want. Cutting them just makes them easier to eat. 4. Wash the beans. This super handy expandable/collapsible colander belongs to my mom. You can get one here. 5. 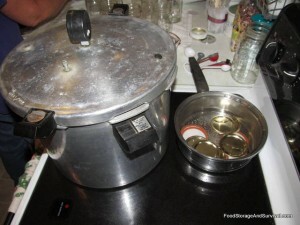 Heat your lids in a pot of water and get about 2 inches of water in the bottom of your pressure canner. 6. Put the beans in jars, leaving 1 inch headspace. 7. Add salt if desired. 1 tsp per quart or 1/2 tsp per pint. 8. Fill jars with hot water, leaving headspace. 9. Wipe jar rims and apply the lids and rings. 10. 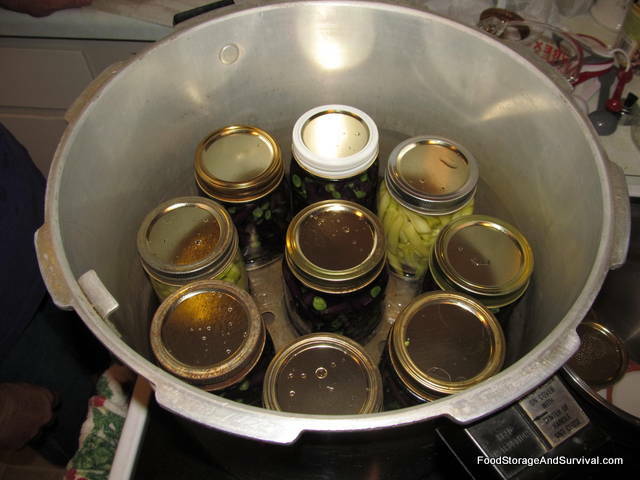 Place the jars in the canner and turn the heat up. 11. 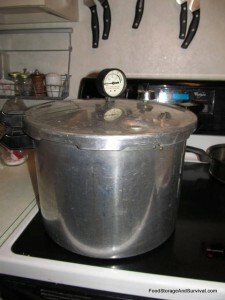 Place the lid on the canner and wait for steam to come out the vent pipe. 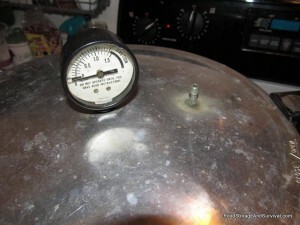 Once the steam is coming out, place the weighted rocker on the vent and process the beans at 10 lbs pressure (adjust pressure for your altitude). Process pints 20 minutes, quarts 25 minutes. Vent pipe with weighted rocker on. Once the jars are cool, label and date them. 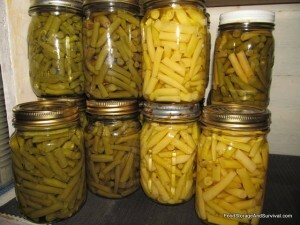 Yummy, easy, home canned green beans! 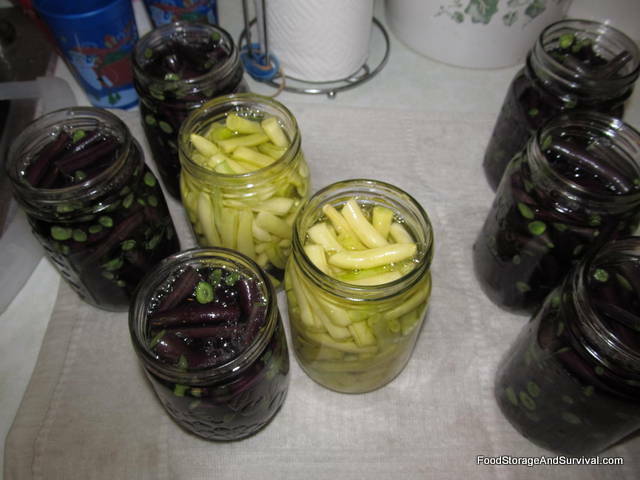 And for those of you who are wondering, yes, this canning was done on a flat glass top electric stove. 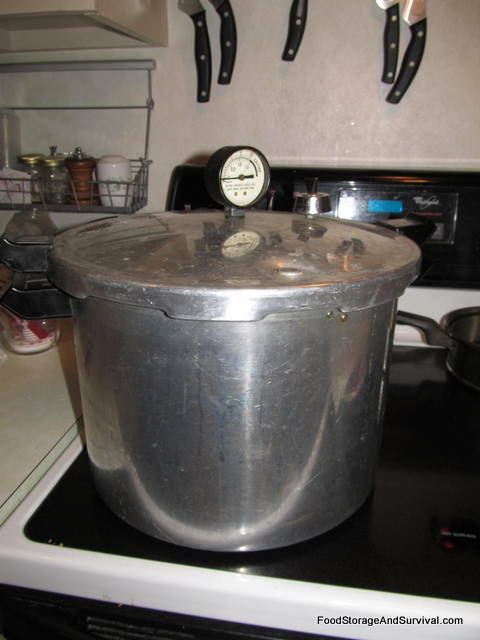 When the canner was done processing, mom moved it off the burner area and let it all cool down. Been canning on this stove for years this way she says. Check your stove’s instructions or manufacturer’s directions if you’re planning to do your canning on a glass top stove. Saltwater pickled beans won’t last for years, but they’ll last a year or so, and without any heating. Great step by step project. 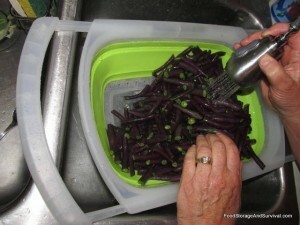 I like to also blanche then freeze my home grown beans with my food saver. I get a good mix of both frozen beans and canned beans. This is the first time I have canned green beans and I have a questions. After processing my green beans when I removed them I noticed that some of the liquid was gone from the jars. Some are just a little and some are about half gone. 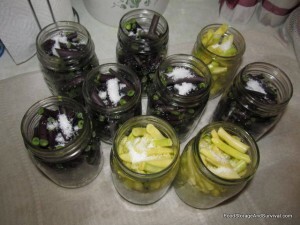 Just wondering if these jars will be ok us store and eat later or should they be eaten right away. I would eat the ones with very low water first. No huge hurry, but put them to the front of the shelf and probably plan on consuming them in the first month or two. I’ve had the water leak out when I either a) didn’t get the lids on tight enough or b) didn’t pre-heat my lids before putting them on the jars. 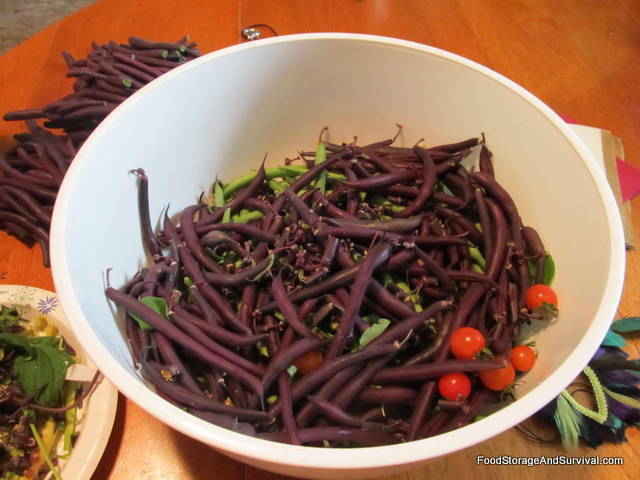 I was wondering if anyone canned green beans using vinegar? 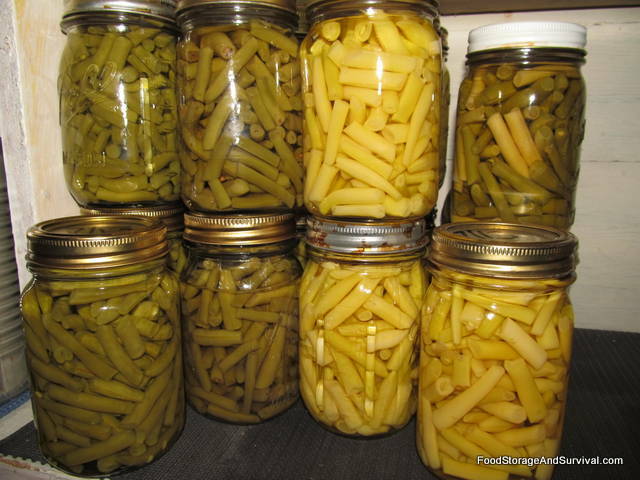 My Aunt always had the best canned green beans that tasted like no other canned green beans I’ve ever tasted before in my “LIFE” they where so good I would not be surprised if the man upstairs was having her can some for him. lol I don’t know how she canned or made them but the taste was unbelievable.